This Italian favourite is quick and easy to create. Use ingredients such as Alimonti Italian Organic Wheat Flour and Carapelli Extra Virgin Olive Oil in the base to add authentic flavours. 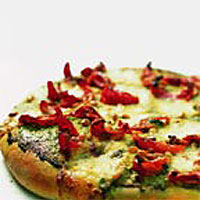 Serve the pizza as a main meal with a simple green salad, or make small, individual pizzas for serving with drinks. Combine the flour, salt and yeast in a large bowl. In a jug measure 275ml hand-hot water and stir in the honey and oil. Pour the liquid into the dry ingredients and mix together to form a ball. Turn out onto a lightly-floured surface and knead fro about 10 minutes, until the dough is smooth and elastic. Place in a large, lightly-oiled bowl. Cover with clingfilm and leave in a warm place for about 1-1 1/2; hours, until the dough has doubled in size. Using a floured hand, punch the risen dough to knock out the air bubbles. Turn onto a lightly-floured surface and knead lightly. Roll the dough out into a circle, about 30cm diameter. Using a rolling pin, lift the circle of dough carefully and transfer it to a baking sheet. Preheat the oven to 200°C, gas mark 6. Spread the pesto on the dough base leaving about 1cm around the edge. Spoon on the tomato and mozzarella salad. Allow to stand until the dough has doubled in size (about 40 minutes). Bake in the preheated oven for 20 minutes until the crust is crisp and golden. Use a pallet knife to lift the pizza from the baking sheet and check the dough is cooked. Use Waitrose Select Basil Oil (extra virgin olive oil infused with basil) in your dough for added flavour. Before you begin, ensure that you have a warm place in which to leave the bread to rise - an airing cupboard, warm kitchen or sunny part of a room are all ideal. To make 2 thin-crusted pizzas, use the same amount of dough but divide it into 2 pieces and roll out thinly. Dough can be frozen after the first rising. When required, defrost in the fridge, roll into shape, add the topping and allow to rise before baking. Finished pizzas will also freeze well - defrost thoroughly then cook in the same way. Make a calzone, which is a folded-over pizza, by rolling half the dough into a round and putting your chosen filling on one side only. Fold in half and sprinkle with a little Waitrose Grated Mozzarella cheese. Cook at 200°C, gas mark 6 for 20 minutes. Try Waitrose Bistro Tomato, Mozzerella and Wild Rocket Sauce - from the fresh sauce range - with Waitrose Grated Mozzarella cheese on top. Waitrose Italian Red Pesto Basil Sauce makes an excellent base for other simple toppings such as ready-cooked roast chicken breast, salami, or grated mozzarella cheese. Baby leaf spinach or rocket leaves are good partners for cheeses such as Brie or Gorgonzola. Marinated Field Mushroom Salad, prepacked from the deli cabinet, is ideal with cheese. Try it with freshly grated Parmigiano-Reggiano, sliced fresh tomatoes, basil leaves and baby mozzarella cheese.